Location: Northwestern Tompkins County, Route 89, eight miles north of Ithaca. Taughannock Falls State Park contains an outstanding waterfall that is 32 feet higher than Niagara Falls. This is a must see for all waterfall lovers. Starting from the Gorge Parking Area, located next to Route 89, follow the Gorge Trail westwards, along the bank of Taughannock Creek. 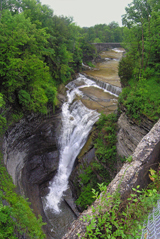 You will quickly come to Lower Taughannock Falls, which faces to the northeast. 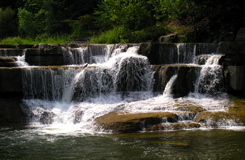 The falls is 20 feet high, has a crest that is roughly 70 feet wide, and is capped by Tully Limestone. Continue hiking upstream along the easy and very scenic Gorge Trail. In roughly 0.7 of a mile you will come to a bridge that crosses the creek. From the bridge you will get your first view of Taughannock Falls. Once across the creek it is a short distance to a lookout near the base of the falls. This inspiring waterfall, which faces to the northeast, is 215 feet in height, and has a crest that is roughly 35 feet wide. 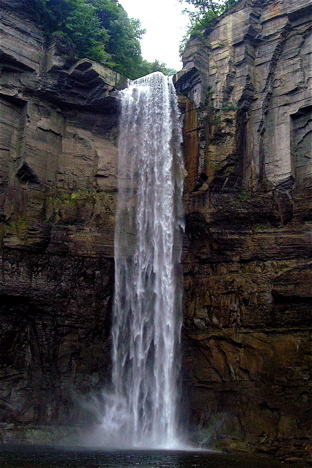 Taughannock Creek makes this dramatic plunge in one glorious leap, making it the highest single vertical drop waterfall in New York State and the Northeastern United States. The view of the falls and surrounding amphitheater is stunning, with the encircling cliffs attaining a height of roughly 400 feet. Look closely at the cliff face beside the falls and you will notice two major rock formations. 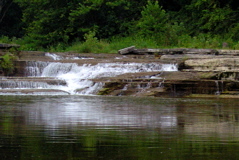 Starting near the base of the falls is the black colored Geneseo Shale, which is about 90 feet thick. Above this is the tan colored Sherburne Siltstone. The natural joint and bedding plane structure of the siltstone causes it to break off in rectangular blocks, giving the cliff a somewhat artificial appearance. For another outstanding view of Taughannock Falls return to the Gorge Parking Area and turn left (northeast) onto Route 89. In 0.3 of a mile turn left (southeast) onto Taughannock Park Road. In about 0.8 of a mile you will come to the large Falls Overlook Parking Area on your left (southeast). Look for a large sign along the southeastern edge of the parking area. This sign explains how the falls was formed. A short distance to the right of the sign is a stairway that leads down to the overlook, which offers a spectacular view of the falls and its amphitheater. From the Falls Overlook Parking Area continue along the park road for roughly 0.5 of a mile and turn left (south) onto Jacksonville Road. Immediately after crossing Taughannock Creek turn left (east) into a small parking area. Follow the Rim Trail a short distance to an embankment for an abandoned railroad. Follow the trail to the top of the embankment and turn left (northwest) to the bridge that crosses the creek. From the bridge you will be able to view Upper Taughannock Falls. 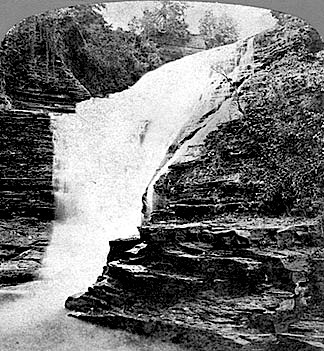 In the past this waterfall was known as First Fall or Summit Falls (see photos below). This extremely steep curving cascade faces to the east, has a total drop of roughly 80 feet, and a crest that is about 35 feet wide. Look upstream of the falls, along the southern side of the creek, for a tributary stream that falls 20 feet to join Taughannock Creek. Go back down the embankment, passing under the railroad bridge, and follow the Rim Trail to the northeast for some great views of the Upper Taughannock Gorge. 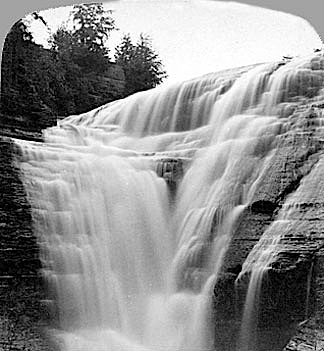 A major rock fall occurred at the crest of Taughannock Falls sometime between 1888 and 1892. Before then the crest of the falls was convex and overhanging. The photo below and to the left is from a postcard postmarked 1911. 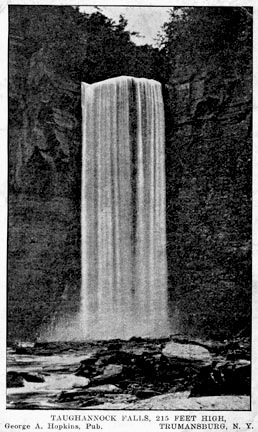 The photo of a man standing near the crest of the falls is from an old sterio card. Photos of First Fall or Summit Falls from old sterio cards. 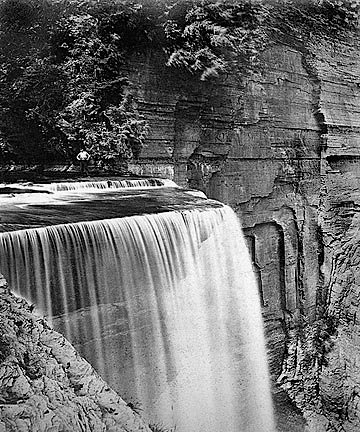 It is now known as Upper Taughannock Falls. Aerial views of Taughannock Falls from a custom built quad copter.